The Southwest Montana Mountain Bike Association (SWMMBA) operates to accomplish our mission statement. The Board of Directors is the executive body which interprets our mission, applies that interpretation to executing the mission, and strategically plans future actions to accomplish our mission. Our Board is not paid in any way (other than smiles), they are all volunteers. Essentially, these are your elected representatives, their job is to best accomplish our mission for our members. There are a maximum of 12 Board Seats, the SWMMBA Board has traditionally operated with between 8 and 12 members. Board Members are not compensated in any way for their work. What’s Involved With Serving On The Board? The level of dedication to our mission is impressive when it comes to the Board of Directors. The average number of hours volunteered in 2018 was 15 hours per week per board member. In one week, during a larger fundraising drive, board members volunteered a total in excess of 200 hours. On top of volunteering at events and completing assignments, board members attend a minimum of one board meeting and two committee meetings each month. Additionally, board members receive training in various software platforms we use to better serve our mission. Board members each have an official SWMMBA email address and access to our internal Slack group where the majority of internal communication occurs. Some board members are in charge of delegating work to committees, managing volunteers, interacting with contractors, or even collaborating with land managers. Our board has set roles for most directors, each have goals and responsibilities to keep the organization moving forward. If you see them around, thank them for their work! Ian grew up in rural Maine, near Acadia National Park; needless to say he’s been riding a bike in the woods for a long time. He didn’t officially start mountain biking until moving to Montana, where he got his first experience of cross country riding on the Bangtail Divide. Ian has a special place in his heart for high altitude, high difficulty rides which makes the Lionhead region of the Henry’s Mountains an area of special interest for him. Ian is one of the original founders of SWMMBA, and is always looking for ways to improve the nonprofit. Bikes have been a part of my life for as long as I can remember. I have spent my working career helping others find the joy that comes from being on a bike through sales and service. I enjoy giving back to the cycling community and advocating for something I am so passionate about. I joined the SWMMBA board to advance fat bike opportunities in Gallatin Valley. Turns out you can't just focus on one segment of cycling when you are on the SWMMBA board which is pretty great. I have been biking my whole life and love the riding around Bozeman. I joined the board to help keep the riding around me in good shape and available. Mike is originally from New Hampshire where he grew up skiing and biking through the woods. He moved to Bozeman in 2008 to attend MSU. Now he works as a manager at Town and Country Foods. He earned his EMT in 2016 so he could do volunteer ski and bike patrol at Big Sky Resort. In 2017 he earned his IMBA level one mountain bike certification and began coaching with Bozeman Youth Cycling. 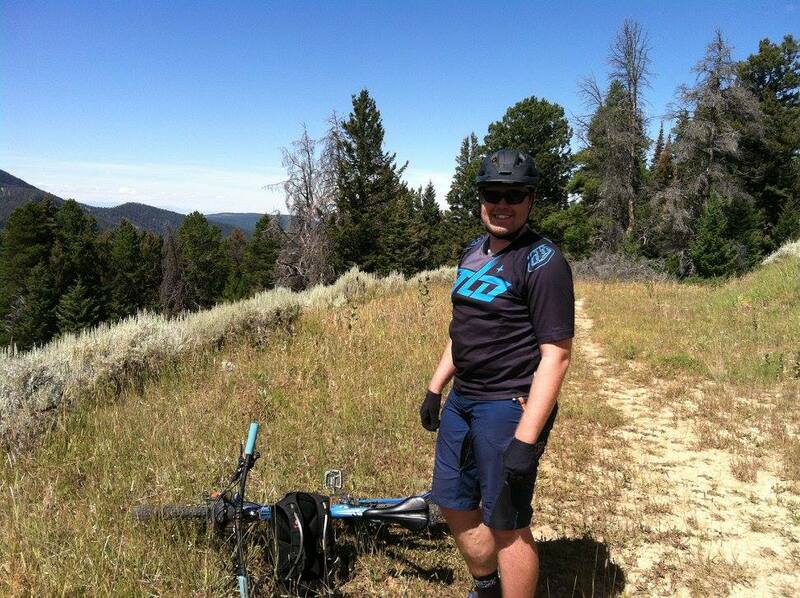 He has been an avid mountain biker since 2010 and really enjoys long rides and type two kind of fun. He has been an avid volunteer with SWMMBA for the last few years with Fundraising and Development and through trail work and recently stepped up to fill the Secretary position. Five generations ago Melissa Cronin's family homesteaded between the Conrad and Niehart, MT raising horses and herding sheep. This history coupled with growing up in a passionate skiing family at the base of Bridger Bowl has instilled a love for the outdoors, backcountry places, exploring, solitude and adventure. Melissa lived in Big Sky with her husband and family for 25 years where mountain biking became an important part of their lives. It was riding the backcountry trails in the Big Sky area and being an active participant in the Travel Planning for the Gallatin National Forest that has solidified Melissa's commitment to advocating for mountain bike access, the creation of new trails, land stewardship, trail maintenance, advancing mountain bike culture and community service. Kyle was raised in Minnesota farm country where he rode his BMX bike everyday to visit his friends. He started working for REI in 2008 and bought his first mountain bike shortly after that. In 2010 he took the opportunity to move to Bozeman along with his wife Emily. Since then, Kyle has been a bike tech at REI and trail work volunteer. He enjoys all forms of riding bikes - you may see him mountain biking on local trails with his two dogs, at a Wednesday night cyclocross race or biking around town with Emily. Kyle joined SWMMBA to be more involved with trail building and maintenance. He is looking forward to getting into the woods with the community where we can all make a difference in the sustainability of our local trails. Adam has been interested in the hands on aspect of trails for many years. He first got involved with the board for trail maintenance, but has since put a lot of effort into advocacy as well. Adam is one of the original founders of SWMMBA. He sometimes rides a fat bike, but mostly sticks to skiing in the winter where turning and stopping seem to work better. David Tucker has been riding bikes in the mountains of southwest Montana for the last decade and is excited to grow our mountain-bike community. While he hails from the urban east coast, he's found a home for himself in Bozeman, working in outdoor-media production. His favorite after-work ride is History Rock, and his favorite backcountry trail is Targhee Creek in the Lionhead. In winter, he likes to ski at Bridger. Lindsay grew up in rural [flat] eastern Montana, and moved to the western region over 20 years ago and now lives in Manhattan. While always appreciating bikes, the topography of the Gallatin Valley made biking on road, trail or snow an entirely better experience. Lindsay is an architect and partner in a regionally-based design firm, and is assisting in the planning of amenities for projects. Lindsay is excited to serve the board and its membership, and is especially thankful for all of the new trails at Copper City where she rides as often as possible with her family. Lindsay further participates in the local biking community supporting Gallatin Valley BMX and her two young racers, and the Bozeman Pedal Project and its weekly group rides. Christian is a Bozeman area father, husband and attorney who brings his passion for mountain biking and a legal perspective to the SWMMBA Board of Directors. Christian is of counsel to a Boston based law firm. His practice focuses on representing victims of toxic exposures across the country, primarily children with birth defects resulting from parental exposure to chemicals in the workplace. He is a graduate of Colorado College (B.A., political science) and New England School of Law (J.D.). Christian joined the SWMMBA Board to lend a hand in the best way he knows how to the creation, maintenance, preservation, and promotion of mountain biking trails in and around beautiful Southwest Montana. Christian is proud to contribute to the SWMMBA effort, and in awe of the tremendous hard work and results of SWMMBA’s volunteers and other Board Members. Click the photo to apply!